Hockey analytics may still be a divisive subject but it’s not going away, in recent years NHL teams like the Toronto Maple Leafs and New Jersey Devils have hired staff specifically to work on statistical analysis. NHL.com now carries enhanced stats for those interested in the insight this extra level of data can offer. 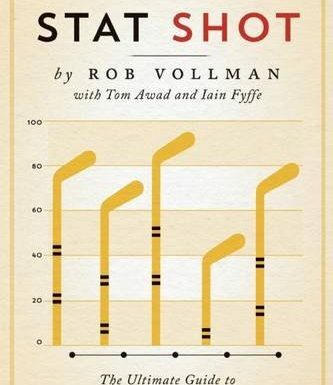 In episode 97 the guys spoke with Rob Vollman about his new book Stat Shot, written with Tom Awad and Iain Fyffe. If you haven’t yet listened to the episode, go back and do it now. I’ll wait. The guys also gave away a signed copy of the book. For those of us who weren’t lucky enough to win, and are considering buying, is the book worth spending your hard earned cash on? The short answer is yes, it’s a very good book, mostly because this is not purely a book about analytics. It’s a book about hockey, as seen through the eyes of analytics. This perspective gives an interesting, and sometimes surprising view on the game we know and love. I was hesitant starting Stat Shot because I don’t know very much about analytics, I think they’re important and have a lot of respect for those who crunch the numbers, but it’s always been something I’ve been happy for others to deal with. The book didn’t drown me in terminology and math that I couldn’t grasp, but I do wish I’d read the original Hockey Abstract books before picking this up. There are a few things that went over my head, but nothing that limited my enjoyment of the book. As discussed in Vollman’s interview, the book is framed as a series of questions in which the answer can be found by applying analytics. The questions range from finding the best way to build a team, to finding the most one-sided trade. Remember in class when the teacher told you to show your workings? There’s plenty of that. The language, although very math based, doesn’t alienate and the articles are well structured, providing insight and reason for looking at each question. There’s a gentle sprinkling of humour throughout and some pretty cool little cartoons. Each author has his own style, but all complement each-other. Given the nature of the book, and the different questions discussed within, there were some I found more interesting than others, but that only adds to the charm of Stat Shot, there’s a little something for everyone. Even us Red Wing fans. I bought the Kindle edition and the charts/cartoons were displayed with no issues (both on the Kindle itself and on my phone). This is definitely a book you should pick up. Vollman, Awad & Fyffe clearly love what they do, and this shows in the writing. Whether you’re a serious stats person, or just someone looking for a different take on hockey, this makes a nice change to the usual autobiographies. I guarantee that you’ll learn something by reading Stat Shot. Have you bought Stat Shot yet? What did you think? Comment below or join in the conversation on twitter.